Your walking tour shows you the transformation of Denver’s lower downtown warehouse district (LoDo) from an afterthought to 'the spot' for locals. Stroll through what was once skid row, past Coors Field, and into River North (RiNo), arguably the hippest up-and-coming neighborhood in Denver. Along the way, stop for a lunch of all locally sourced food. The chef here forges personal relationships with each farm he works with; his team visits the farms and works in the fields with farmers to understand exactly what goes into the food they proudly serve. Next, you’ve got a very important decision to make: which Colorado beer will take its claim as your favorite? 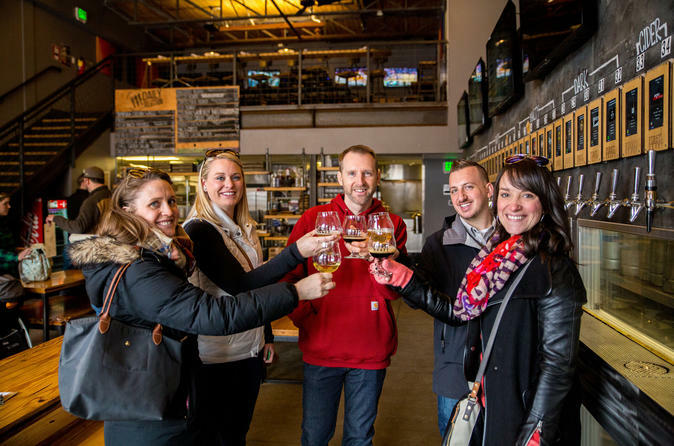 Don’t worry, you'll visit a local watering hole where you have plenty of time and can sample from a self-serve tap that features 15 local beers, a cider, and wine. Then it’s off to explore the creativity of the River North Arts District, where the art refuses to be confined behind closed doors. Each year, artists are given free rein to turn the walls of local buildings into their canvases, and the results are stunning. You’ll have plenty of time to take pictures and decide which artists to follow on Instagram as you make our way through this living gallery. Close out your tour with a short ride back to where you started on the recently opened Denver light rail line that runs the 25 miles from downtown to Denver International Airport. Your tour starts and ends at Union Station; meet by the flagpole at the main street-side entrance (if there is inclement weather, meet under the awning by the main entrance).